Summit Post suggests this as a Spring hike before it gets too hot here. I was told that bears are not a problem (which makes sense given the terrain) and I didn’t bring a canister. 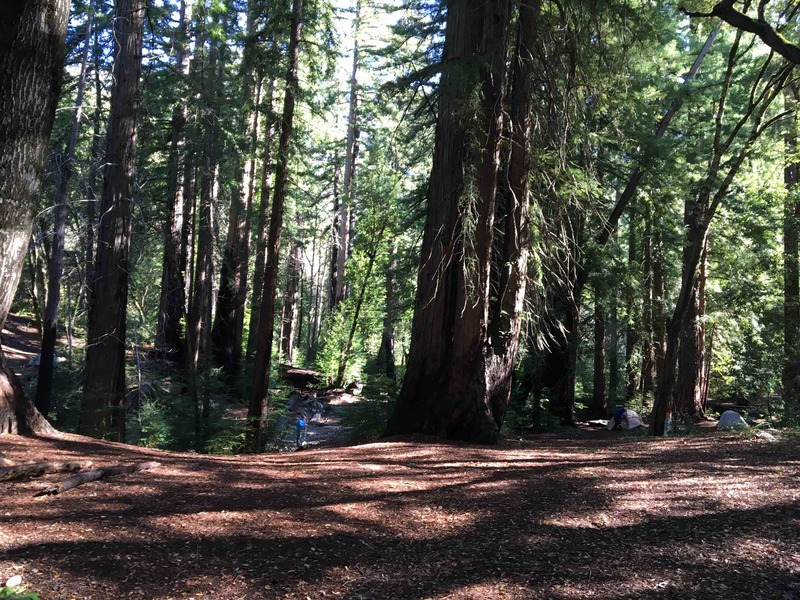 Also, this is the first place of my four years in CA where I’ve seen campfires outside of rings allowed (after a short video to obtain a permit). 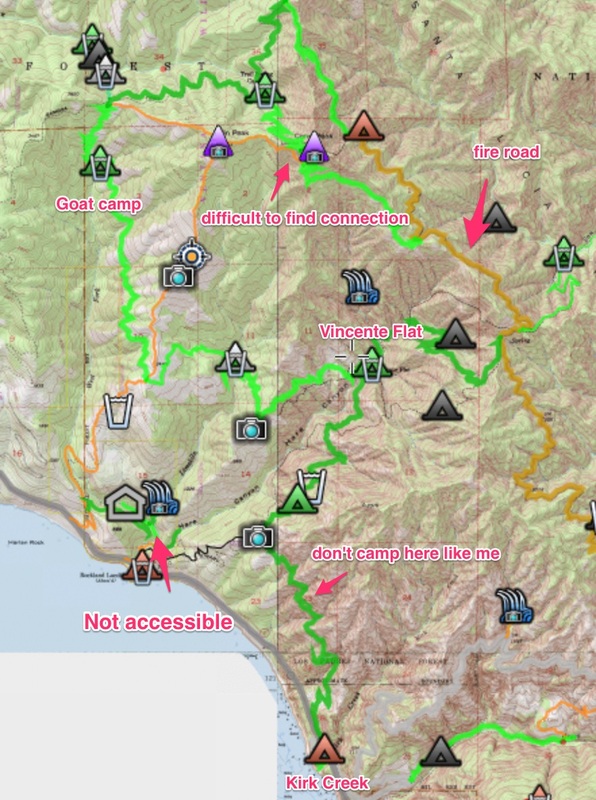 As per maps, I couldn’t find anything from Los Padres National Forest itself, but bigsurtrailmap.net worked great! 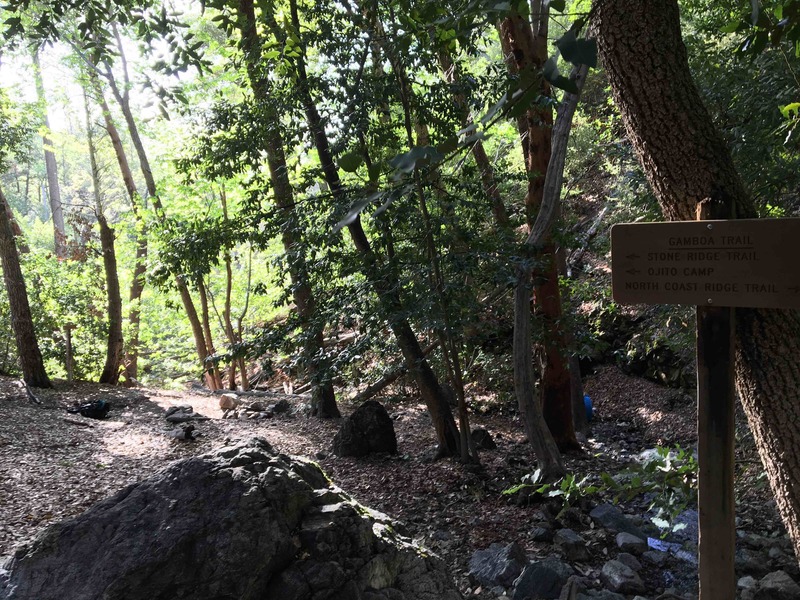 Finally, dispersed camping is allowed and while these ‘campgrounds’ are typically more comfortable, there are other spots to camp if you please. 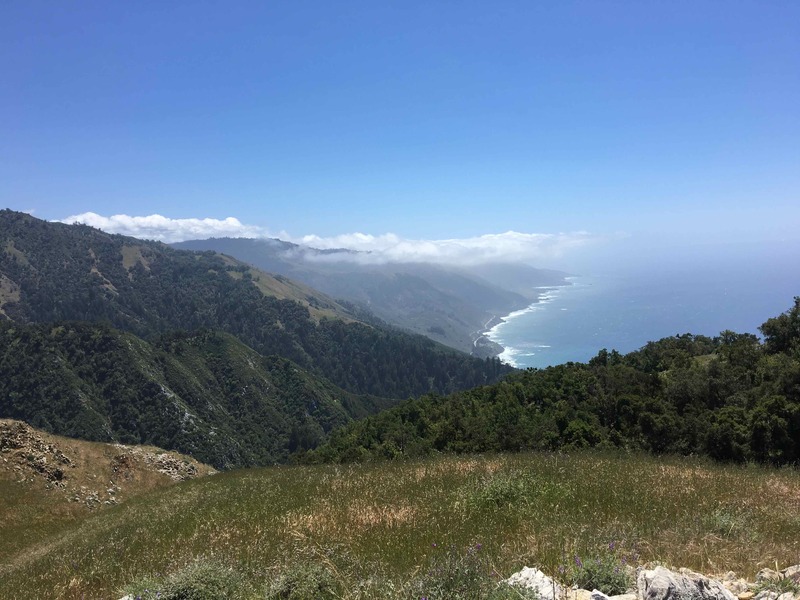 In all, our trip took us 31 miles and 8000 ft elevation gain up from Kirk Creek to Cone Peak, past Goat camp and then back out. We left the bay area at 4pm and got to Limekiln around three hours later. 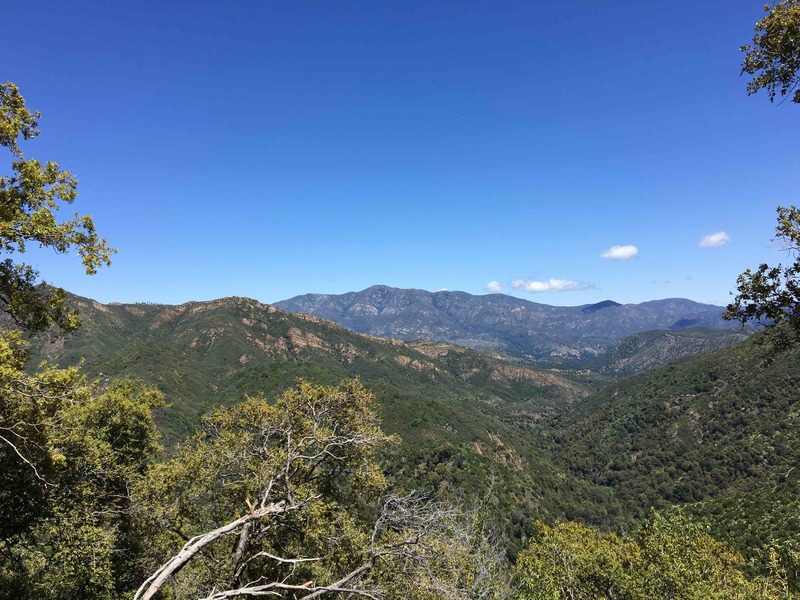 Our plan was to take the marked trail from Limekiln campground up towards the peak, however the camp ranger turned us away saying that trail is too dicy and they don’t allow people on it anymore. So… we drove a little bit before parking on the side of the road by Kirk Creek and entering from there. This five miles between Vincente Flat and Kirk Creek offers striking views of the coast line and we saw couple whales on the way up as the sun set. After an hour walking in darkness we finally called it quits next to another hiking pair camping on a slopped ridge. Our tent was basically on a bush and it wasn’t ideal, but it worked. Had we hiked another half hour or so we could have made it to the first ‘campground’ which had very flat terrain. I recommend that first ‘campground’ over sliding around your tent all night like we did. The next morning we descended into Vincente Flat and found a sprawling camping area with lots of fire rings and flat space. You can tell that this place gets busy in high season, but there were only 5 or so tents spread out very well when we passed through. While we momentarily stopped to fill water we chatted with a number of people who decided to do the 20 mile loop in a day, returning to Vincente Flat instead of hiking up with their backpack. Taking a right from Vincente Flat we began hiking along a lush stream. After a little while you leave the stream to head up ridgeline where you blow your way through overgrown bushes and trees until emerging on a fire road. 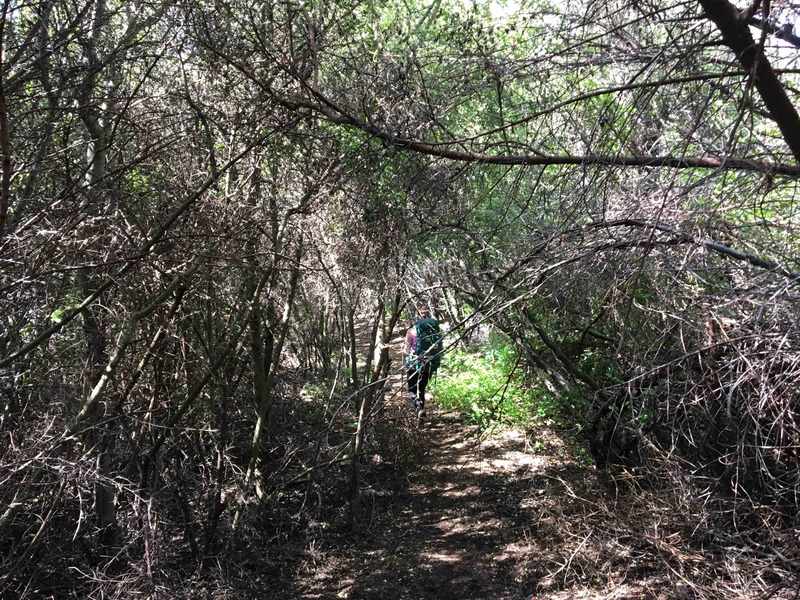 Charging through overgrown fauna is a typical task on this hike. Lots of bees but no stings! This fire road isn’t spectacular, but the views of the Eastern ridgeline are. It is a couple miles on this road and you turn left back on trail. 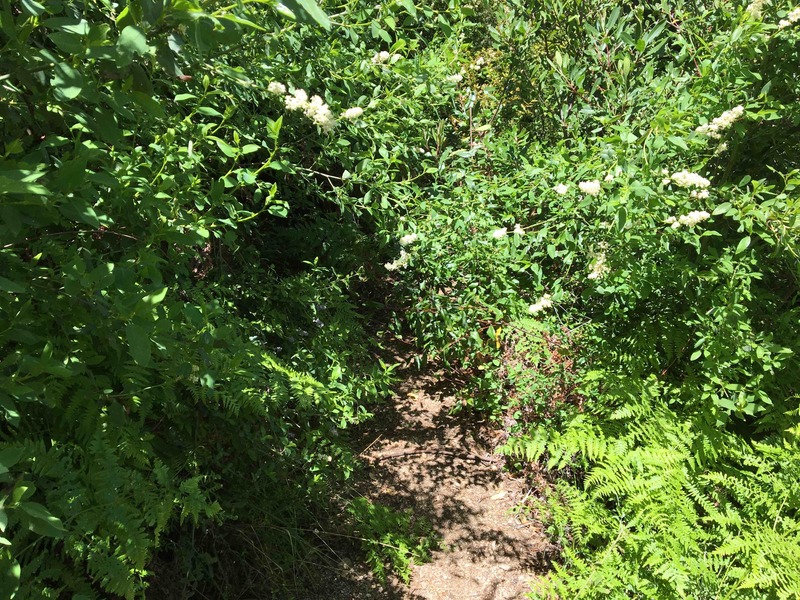 All the junctures of these green trails were marked very well. From the junction you climb to the base of Cone Peak and then head up. 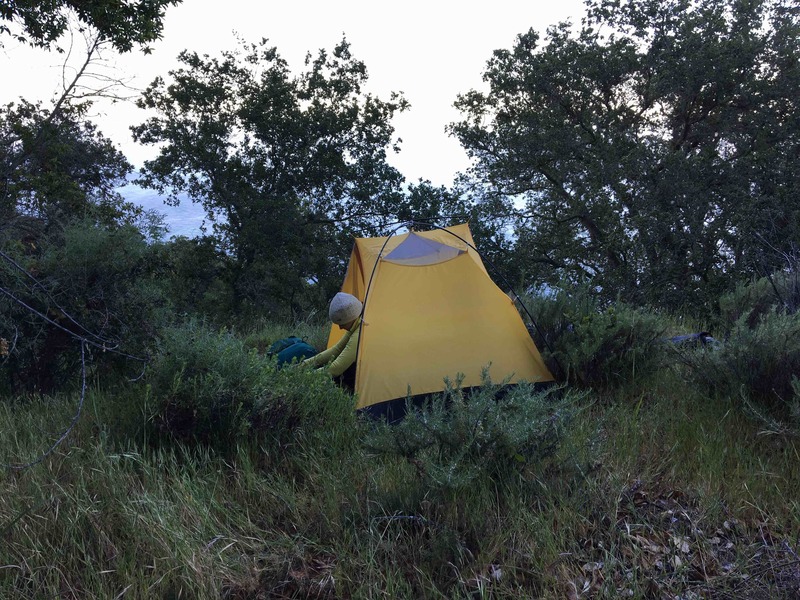 We were told that Goat Camp was a nice small camp with amazing ridgeline views so dropped our packs to hike up to Cone Peak and then come down and take the small orange trail headed towards Twin Peaks and Goat Camp via the map above. Once you turn towards the peak its only about 1000 ft to the top and you get there pretty quickly. 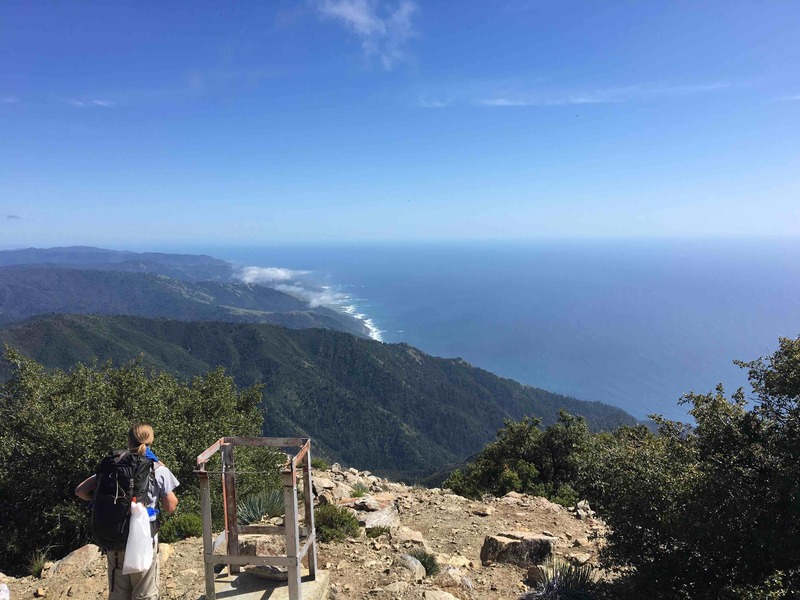 At the top we indulged in both views of ridgelines plummeting into ocean and also a spectacular view of the Los Padres Mountain Range. The boarded up fire lookout up here was also a bonus! Heading back down, we grabbed our packs and began searching for this ‘orange’ trail. I didn’t have enough map detail to see exactly where the connection was and was unable to see for sure where it turned off in person. If you want to do this make sure you bring some map that has enough detail to show the exact point because otherwise it will be very unclear. Unable to feel confident that we would be on the right track we returned to the Cone Peak saddle (now with our packs) and then down into Trail Springs for the night. We met some fun people at Trail Springs, but the camp area itself wasn’t great. Very few spots (maybe four? ), most not level and all rocky. The next morning we woke and headed towards Goat Camp. This side of the mountain had more downed trees than previously encountered and we had to hop over many large trunks. Reaching the Northwest side of Twin Peaks the ‘orange’ trail we missed yesterday was much clearer at this junction. Descending from the ridge into the valley we were shaded by a tree-tunnel which was an enjoyable change from ridgeline. 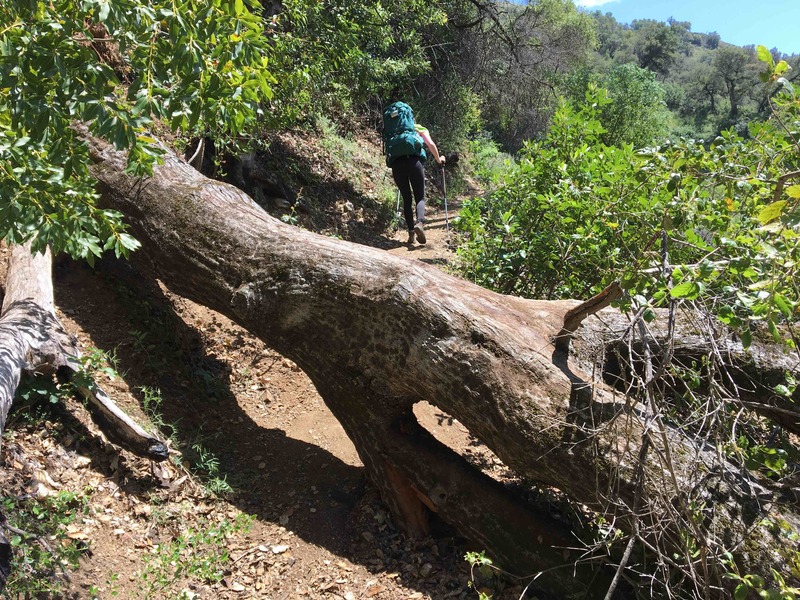 The rest of the hike meant going into and climbing out of four ridges until we arrived back at Kirk Creek. 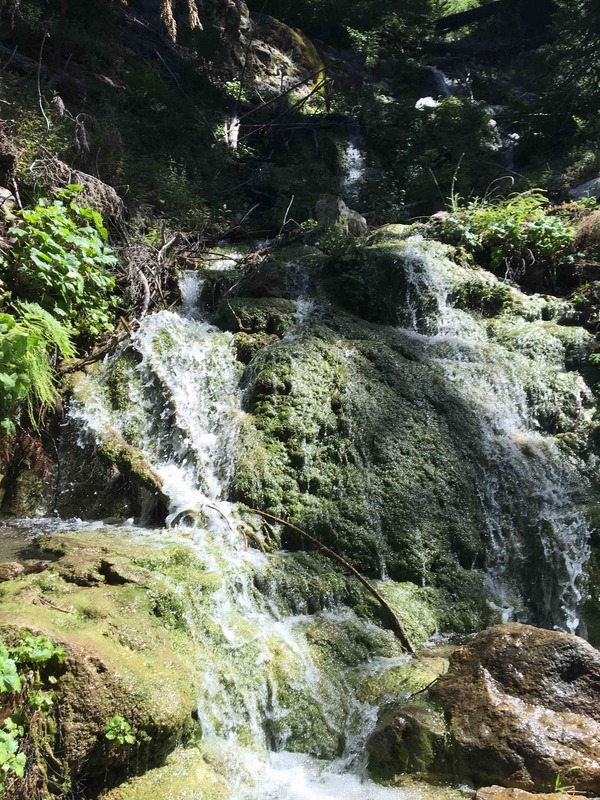 On the way we saw an amazing waterfall over green mossy rocks and under a large fallen redwood. As well as soft wildflower meadows as views of the ocean became more clear.